More information on how to interpret the cellular transmission location maps. Icons indicate both the provider name and the type of cellular equipment used at that location. Macro cells indicate a full-sized site that is omni-directional, two- or three-sectored. Micro cells show smaller sites that have been placed to cover holes in the macro cell sites (these are provider dependent, and not all provders will use these types of cells). Repeaters are sites that enhance the range or direction of a macro site. Pico cells are very small cells that are commonly found inside buildings that provide coverage to areas with high cell phone usage patterns. Telus Mobility purchased Clearnet in the summer of 2000 and now has migrated all Clearnet PCS customers over to its network in BC and Alberta. Some Clearnet towers are still in place and these have been covered over to Telus 1900 MHz CDMA sites. Original blue Telus sites indicate any or all of the following: 800 MHz AMPS, 800 MHz CDMA, and/or 1900 MHz CDMA cells. 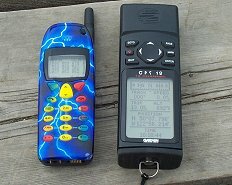 Original green Clearnet sites indicate 1900 MHz CDMA only. Rogers runs five different wireless services: 800 MHz AMPS, 800 MHz tdMA, 1900 MHz tdMA, 850 MHz GSM and 1900 MHz GSM. Red icons indicate any or all of AMPS or tdMA cells at a location. Brown icons indicate the presence of their new 850/1900 MHz GSM equipment. Microcell Connexions: Microcell operates a 1900 MHz GSM network within Canada and resells the service to various GSM providers, including Microcell Solutions (Fido), Cityfone, SimPro, and Connectel. Purple icons indicate Microcell GSM cells. Bell Mobility: Bell operates both 800 MHz AMPS and 1900 MHz CDMA services in Ontario and Quebec. In other provinces Bell only operates 1900 MHz CDMA services. Black icons indicate the presence of any or all of AMPS or CDMA equipment. Telus Mike: Mike is an 800 MHz iDEN system available in BC, Alberta, Ontario, and Quebec and is indicated with orange icons. Other providers: In situations where the icon legend does not account for another provider, I have substituted the colour of a provider that offers the same technology and frequency. An example of this would be the icons used to indicate Aliant Mobility sites in Nova Scotia. For the Australian maps I have used the standard icon colours but have denoted which Australian providers these indicate. Icons are placed on maps as close as possible to their actual location. In locations where more than one provider may be present within a city block, icons may be moved slightly to reduce congestion, especially when field test mode information (see below) is given. Icons are placed so that you could find the site within about 150 m, and often most people are curious about a tower in their neighbourhood or the nearest towers to them for signal reception purposes. Site location positions obtained using a GPS unit, photographs of sites, and other details are also available for selected regions. At present this information is available for Victoria, Nanaimo, Western areas of greater Vancouver, Whistler, Kelowna, and some of Halifax. Please use the contact page for additional information. Most of the maps shown on GeckoBeach have been provided by MapBlast. Maps may not accurately depict streets or coastlines and icons have been placed as close as possible to their actual locations. Providers also change or add to their equipment locations from time to time as real estate becomes available or service demands change. Therefore, maps may not show newer equipment locations and/or moved equipment. If you come across equipment that is not depicted on a map or cannot find equipment that is depicted, then please consider submitting site information (see below). You will need to put your phone into field test mode before tracking sites. See the secrets page for enabling some CDMA, tdMA, and iDEN phones. Some phones require a service code to access the test screens and other models require a data cable to receive a string of commands to enable the hidden menus. Analog systems are indicated by a paging channel in the provider's colour that is on a transparent background. Most maps do not have the paging channels noted. CDMA systems use a Pseudonoise (PN) offset values to indicate which sector of the cell you are dealing with. For the example spine to the right, this is a three-sectored site with offsets 006, 174, and 342. Spines on maps are placed over CDMA cell sites to indicate the approximate orientation of the cells (usually separated by 120 degrees). You can use these spines to figure out which tower your phone is dealing with while idling or during a call. Remember that CDMA also has the ability to track your call through more than one tower site, so if your phone has a field debug screen for other tracked cells, you can also use the maps to see which cells are tracking your phone. Maps with spines have the provider's colour used as the background on the PN offset. In situations where there is a variation between 800 and 1900 MHz CDMA sites owned by the same provider, a lighter colour is used for 800 MHz and a darker colour is used for 1900 MHz (at present only applies to Aliant Mobility as Telus Mobility is using the same PN offsets for both frequencies sharing the same site). - Verizon (Charleston, SC): Configurations separated in steps of 3 - Sometimes Telus and Bell will use slightly different configurations than the ones noted above, as pointed out by a GeckoBeach visitors. tdMA paging channels are presently not marked on any maps. If anyone would like to send me tdMA information then I will update the maps. GSM sites often use a similar configuration to the CDMA spine shown above. GSM phones track sites via a cellular tower identification number that is between 1 and 5 digits long. The prefix of this identification number (all the numbers except the last one) indicate the cellular tower number. The last digit indicates the sector of the cell (0=omni, 1=low, 2=medium, 3=high). GSM cellular identification prefixes are indicated on the maps on the provider's background (no spines). Remember to add an extra digit for the sector when tracking these cells. Also similar to the CDMA layout, iDEN sites may be arranged on a spine. iDEN phones track the Broadcast control channel (BCCH) that the phone is currently idling on (this number is in hexidecimal). Omni-directional sites will not have a spine over the site location. I have not been able to figure out a pattern for the layout of the BCCH's on the Telus Mike network. Nextel's network seems to be configured similar to the GSM layout mentioned above: there is a 3 digit prefix for the cell tower number (in hexidecimal), a hyphen, followed by a sector number a site (0=omni, 1=low, 2=medium, 3=high). If you know of a new site, a moved existing site, or have field test mode information for a site and you would like to share it with others then please forward the information using our contact page. If you submit information that is used on a map then you will receive credit on that page (you can also be anonymous if you wish). Many of the sites and some of the pictures on this site were submitted by fellow users.